We’re officially into the new year and over the traditional holiday slumps that bog down the beginning of the year. Along with that come new shipping rates from companies like FedEx and UPS that could raise some eyebrows. Paying an arm and a leg for shipping can seem unavoidable when price hikes hit, and they seem to come at a time when businesses are generally slower post-holiday season. The good news is there are various ways to navigate the high rates that are typical of the shipping companies and get the most value from shipping services for the least amount of money. 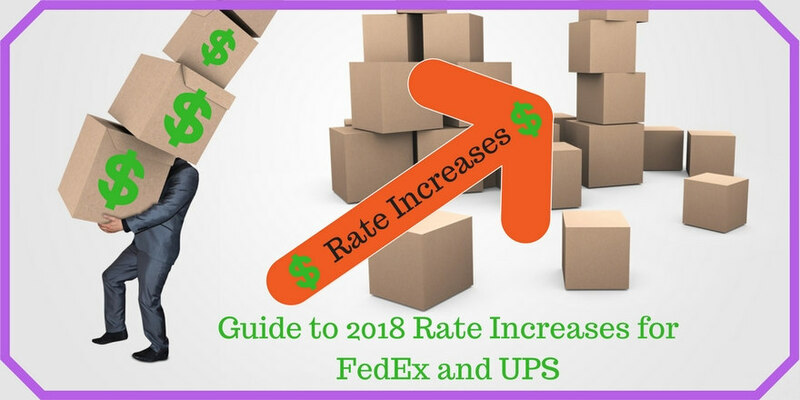 Your New Year’s resolution for 2018 should be to reconsider negotiating your shipping contracts to save on the rate increases this year. These days data is king where a digital revolution has innovated just about every industry–especially shipping and logistics. Shipping is now based on numbers, which when turned into usable data, provides intelligence to deliver increased profits for your business. However, the key is understanding the data coming from the supply chain to make informed decisions. You want to know the important areas to focus on during negotiations with shipping carriers. This can provide leverage to get a substantial discount on a standard contract agreement. To what regions and zones do you ship? What is the weight of the packages you are shipping? How will price floors impact the deal based on your shipping profile? From there, understanding your business’s shipping profile is critical to determining appropriate shipping rates. What is Your Shipping Profile? Shipping companies like FedEx and UPS use your shipping profile to determine the profitability potential of the account. You should know how your profile ranks to better gauge how much leverage you have during the negotiations. Higher rated shipping profiles are more attractive customers for the carriers. They will be less likely to accommodate negotiations for lower shipping profiles. FedEx and UPS are ideally looking for shipping profiles with heavier ground B2B packages on well-traveled routes. This is why it also helps to think like a carrier when you’re at the negotiating table. Shipping contracts are often confusing, and aligning the relevant data with the various provisions is an important step to prepare. Most companies don’t have the expertise or experience to do this on their own, but understanding these elements can go a long way when negotiating for the best shipping rates. For the most part, shipping companies want you as a customer and are constantly trying to gain market share. That’s why understanding your shipping profile and how that relates in the minds of the carrier are important aspects of securing lower shipping rates. This can help when the carrier comes back with a list of additional fees tacked on after the package is shipped. For those looking to avoid the rate increases this year, there might be other options outside of the traditional FedEx/UPS duopoly. While there are other options, like the U.S. Postal Service, and other carriers, most businesses haven’t been able to full extend their shipping needs past one of the two main carriers. However, recently that’s started to change. USPS has stolen back some market share since it launched its Priority Mail service targeting smaller packages. Then, with the rapid growth of Amazon dominating the e-commerce space, the company started offering their own distribution services to fulfill shipping orders as customer demand for faster shipping times has increased. With the level of innovation at Amazon, it wouldn’t be surprising to see them setting the stage for a shipping and logistics service of their own. The recent pressures of FedEx and UPS dominating the shipping sector might finally be easing, presenting opportunities for businesses with shipping needs. The trend that Amazon is feeding into is a more flexible approach giving the business and customer more options. This includes their new Seller Flex program which gives businesses the option to have Amazon’s delivery drivers pick up and deliver packages without using the Amazon warehouses, allowing many more items to be eligible for Amazon Prime status in 2018. Major retailers like Target and Walmart are also getting into the game with shipping services and delivery options for their products. In order to compete with e-commerce giants like Amazon, these traditional retailers are reacting to the trend of customers shopping at home and having products delivered to the doorstep rather than visiting the brick-and-mortar store. This all means that FedEx and UPS are losing traction with some of their largest clients, and will likely continue to do so as this trends gains momentum. This opens the door for other businesses to have more options and gain bargaining leverage when discussing shipping rates. Savvy businesses will recognize these trends in the shipping industry and use them to their advantage to get the best shipping rates. The first step is to gather shipping data to get an accurate picture of the business’s shipping profile. From there, you can understand the role you play when it comes to the major carriers and new players. Knowing the carrier’s perspective will help determine what aspects of the agreement they value. It also indicates what kind of customer they are interesting in. With the number of shipping options growing, the menu of shipping services is also expanding. This creates new options for businesses to leverage to find the best rates and deals for their shipping needs. Thank you for sharing this information actually we don’t know about that. Every people want to do business now and sell their product..
Can you provide me a statistical data for the analysis of fedx growth and i really appreciate you for writing this valuable post with us. Good article. thank you for sharing useful information.Thanks for sharing this important news. because many businesses are using FedEx and UPS for shipping purposes. So this article is very helpful for me and also many business players. Glad to know about the changes in rates of both companies. Now a sender can evaluate the shipping option before choosing one. Thanks for sharing good information. Most larger merchants only use one of them because they negotiate volume discounts. So once they decide which shipper to use, they will send everything by that method even if individual shipments could have been cheaper with another. I agree there has been a lot of manipulation of shipping fees on eBay. Buyers beware and check those costs carefully! I left ebay because of that whole mess. With all of the peopel including shipping or not including shipping… On the seller side the discounts on shipping continue to dwindle. So unfortunate. Both are the best shipping companies. I am glade to hear about new rates of these companies in 2018. Sender should also evaluate the shipping option before choosing one. Thanks for sharing in inforamtion. Great post and an interesting take on shipping, didn’t know there was so much to consider! CryptoGeorge would love you to read ..Should startups care about profitability? Thanks for sharing this important news. because many businesses are using FedEx and UPS for shipping purposes. So this article is very helpful for me and also many business players. The internet makes the world feel small until you need to pay for shipping. Then you realize how big the world actually is. This is a test comment; testing CommentLuv to ensure it works with https now. This is a test comment to ensure that https links now work with CommentLuv on GrowMap. FedEX and UPS both are the top player in shipping industry. It is good to know that they have changed their rates for 2018. A sender should evaluate the shipping option before choosing one. This creates an even bigger problem when selling Ebay because sometimes customers give a negative feedback simply because the cargo price is too high. That is why most sellers who are top sellers do not charge for shipping. They increase the price of the item to provide free shipping. That some price items abnormally low and then shipping ridiculously high also makes buyers suspicious of all shipping costs.